Wandering through the industrial neighborhood of West Oakland, You'll find more than a few warehouse art studios, each one filled to the brim with all manner of projects; from giant robots to huge metal art – and of course steam machines. A few days ago, I was fortunate enough to be invited into the studio of one of the artists that reside there; a fine chap by the name of Tom Sepe. After sending out a call for willing subjects (aka, interview-ees), Tom contacted me and, with but a few words, lured me into his studio. Those words were simply: "Want to come see my electric-steam hybrid motorcycle?". He calls it the Whirlygig Emoto. What self-respecting grease monkey could possibly refuse? Sure, it meant a long haul across water and land. But I put my nose to the grind-stone for you, and for science. SteampunkWorkshop: Whoa! This thing looks awesome, tell me about how you built it. 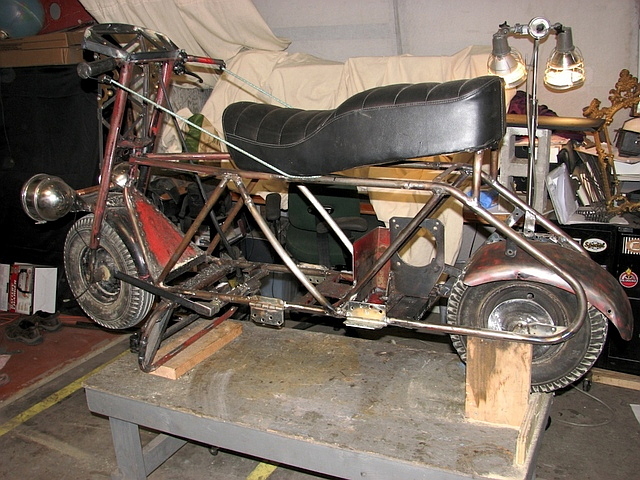 Tom Sepe: The frame is 1967 Tote-Gote, so it was one of the first off road motorcycles. I started with the frame a year ago, toying with making it electric. TS: I had a small motor lying around my warehouse, and I tossed that in. It worked, but it wasn't very efficient. So then, in 2007, I said 'I'm going to take this to the next level'; and got this motor. It's essentially the same motor that's used in electric motorcycle racing – a 15 hp motor – and that basically gave me the ability to really make sure I had the power I needed to ride this thing, and since it's the most efficient motor it gave me the most bang for my buck. cut it in half and added this cross bracing for strength. Definitely the frame was one of the hardest things. Actually, the rear brakes. It didn't have any brakes, and the first year I bought the bike I thought, oh no! SPWS: No brakes no brakes! TS: Ya, I knew from disaster testing the previous year that if something fails, and you don't have a brake, and the electronics fail, you're screwed. So I wanted to add a mechanical brake. So I manufactured my own disc for the rear wheel. This is just a metal disk I welded onto the rear hub, and I got this [brake caliper] off of a motorcycle brake. It rubs a little bit, but it stops the bike. SPWS: Could you tell me about the steam system? How does it factor into the bike, and how did you go about building it? TS: I call it a steam-electric hybrid – it's stretching the truth a bit. 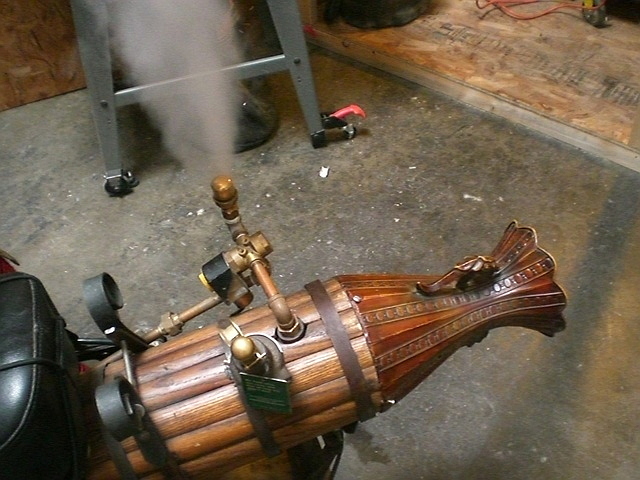 It's steam powered, but it doesn't locamote using steam. 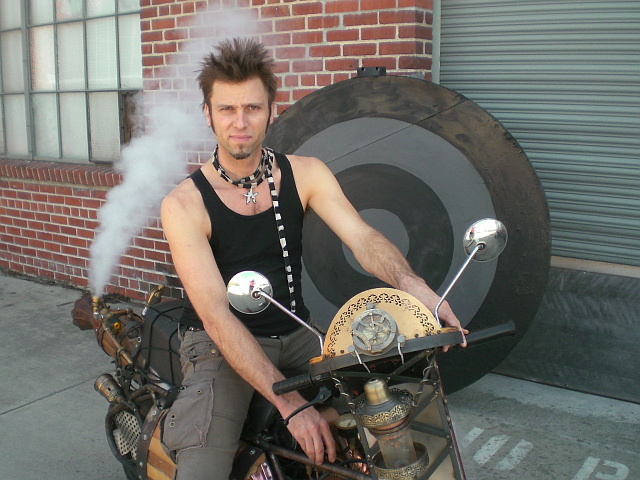 I built a steam boiler, put it on the back of the bike. And I had the possibility of putting a steam piston on the bike. But the more I looked into it, my deadline of getting it out the door was more than the scope of what I was learning. 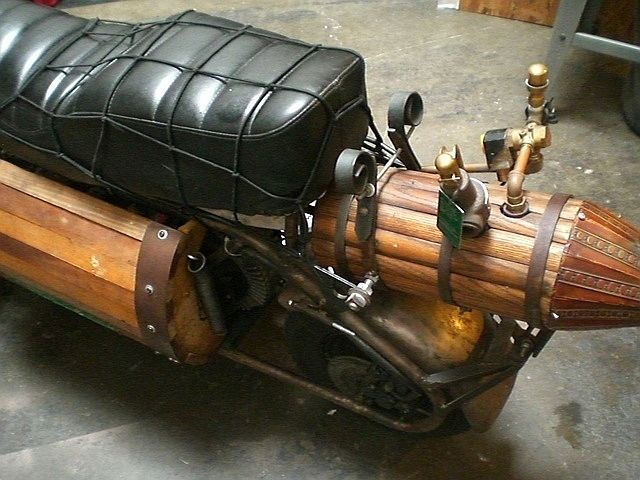 And I realized making a steam-punk inspired motorcycle was what I was going for. So it has a steam boiler on the back, which I use for steam effects, but there's no actual link up between the boiler and the wheels. SPWS: So when you were building this, what did you build the boiler out of? TS: When I was building it, I took a fire extinguisher tank – It all came down to aesthetics. I was looking at my drawings, figuring out where it would go. The steam boiler came from an aesthetic need, form before function, and the fire extinguisher fit what I wanted. So I cut a hole in the bottom of the tank, slipped a pipe in it, welded it on both sides. So that then I had a chamber with a through tube, which became the flame tube. It's not very efficient; there should be more coils in there. But on the other hand, if I crank it up really high, then you get flames shooting out the back of the bike. Which is cool. SPWS: And it's propane powered? TS: Ya, it's just standard propane tank and torch, just stuck it in there, and my friend TIG welded it together and helped me get it all sealed up. There are still a few leaks. We call them safety valves [laughs]. SPWS: I'd love to see it steam up! 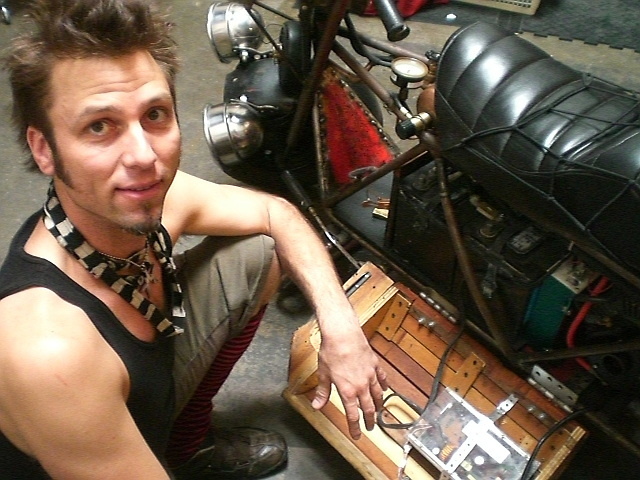 TS: When Sean Orlando, from The Steampunk Tree House, saw me building it he said "whatcha building there? A bomb?" I said, I'm building a boiler. "Looks like a bomb to me!" [laughs] But, so far, so good. Heh. Then, it was my turn, and let me tell you, that think has some KICK to it! It was awesome riding it around! Other folks from the warehouse came out and watched as we both took turns reckless driving the Whirlygig Emoto – a fine project, indeed. Meredith Scheff is a tinkerer, fixit lady, cartoonist, and general silly person. 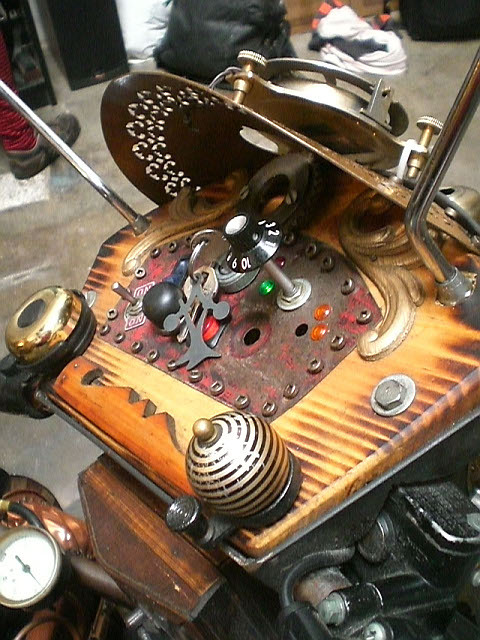 In 2006, she built the Stringamajig, a guitar-playing bicycle; and in 2007 the RaSeCoGee, a mad lib automata. 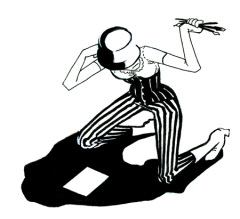 Her weekly webcomic Semaphore updates Fridays. 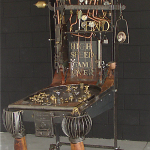 Meredith has also worked on several large projects including the Neverwas Haul (as fabricator and cartoonist), and the Steampunk Tree House (as a welder). She is but a hairs breadth from finishing her degree in illustration at California College of the Arts and sometimes she sleeps. Most of her arts can be found here in her flickr set. as a Service (SaaS) product set. Every talent you learn and develop will assist you develop your game to new levels.